Blackjack Insider is the premiere online gambling newsletter with new articles and reports by top industry experts every month. We accept fixed-rate paid advertisements in the form of graphics banners and text ads for both the web site and e-mail newsletter. We do not currently accept requests for affiliate commission-based advertising (CPA or revenue share). For details on our subscription base and visitor history, click here. SPECIAL ADVERTISING DISCOUNTS FOR THE NEXT TWO MONTHS! 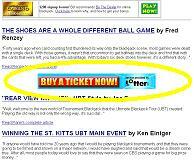 Permanent newsletter ads: Get a permanent text link ad for only $125! Never expires, always prominently linked from our archives of monthly newsletters! Get the details and purchase this unique ad type at our online store. COST: $125... purchase online, fast and easy! DETAILS: 25 words of text and one link. Contextual text links: Build exposure for your web site with a text link on the main page of our web site. Up to 25 words for you to link directly to your site. Blackjack Insider is ranked #1 on terms such as "blackjack newsletter", so leverage our outstanding page rank to promote your own web properties. DETAILS: Minimum of 3 months, paid in advance. Discount: $500 for one year ($100 off). AVAILABLE ON THESE PAGES: www.bjinsider.com, www.bjinsider.com, www.bjinsider.com/reports.shtml, www.bjinsider.com/questions.shtml, and most other pages as requested. Friends of BJI ads: Near the top of every web page in our site, we have a huge 700x100 ad box dedicated to "Friends of Blackjack Insider". The displayed ads are randomly selected from our Friends of BJI list ( click here to see the current list of Friends of BJI). We accept no more than 20 'Friends of BJI' ads at any given time (usually less than 10 running at any one time.) Advertisers can purchase a placement without the normal reciprocal link requirements. DETAILS: 25 words of text and banner/graphics as space allows. Banner ads: Looking for more exposure and improved search engine rankings for your web site, but can't afford a large 'sponsor' campaign with us? No problem... we can place 'inline' banner plus text ads within specific popular web pages in our site for very affordable rates. Advertisers typically choose the main page, or newsletter page for such placement. DETAILS: approx. 468x60, although we can accomodate most banner sizes. Custom linked articles: This advertising opportunity is a great way to promote your properties through custom article pages you provide to us, and we publish within the Blackjack Insider web site. They can be linked from a text or banner ad on the main or newsletter page, and the article itself can contain further forwarding references to your web sites. DETAILS: Article can be a single page of content, hosted on our site. We remove all advertising and top banners from your hosted page. 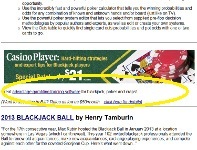 Ad bar: The top of every web page in the Blackjack Insider site includes an ad bar. Ads can be placed in these three spots. You ad will show up on every page viewed by regular readers. An ad can include a graphic banner (468x60 max animated GIF), with 20 words or less of linked text. All our newsletter articles link to the web site, so your ad has maximum exposure and visibility. See the top of this page for examples of our ad bar. DETAILS: 468x60 or less, accompanying text - 20 words or less, linked as desired. E-newsletter sponsor: Each monthly newsletter e-mail includes a 'BJI Sponsors' section. Your ad can be placed in here, including a graphic banner and accompanying text. See Issue #83 as an example of a monthly newsletter with sponsor ads. The same ad is placed in the e-mail body, and is repeated in the web site newsletter copy, which exists forever in our archives! We publish two e-mails a month to our readers: a 'Lite' issue previewing the upcoming monthly issue, and the actual issue. The Sponsor ads are included in both. Single newsletter banner: We'll include your 468x60 banner (or similar size) within the body of one issue of our e-mail newsletter. The banner can be linked as you see fit. A great low-cost way to get great exposure to our whole membership base! DETAILS: approx. 468x60 or less in size. 10k of less file size for banner. Non-US/geo-targeted ads: With the new US legislation regarding online gambling, many advertisers want to have their ads displayed only to non-US web site visitors. We can ensure that your ads on our web site are displayed only to non-US visitors. You even get a 50% discount since you will receive less impressions! We can also accept several different language versions of your ad, and display the correct one by the location/region of the web visitor. COST: 50% rate reduction for non-US only ads. Add 50% to rates for geo-targeting. DETAILS: Only available in limited places on the web site. Main issue articles: Want us to review your web site, online casino, or other gambling related business as an article in our regular Blackjack Insider newsletter? We can do that! We'll complete an exhaustive review, and write it up as a regular monthly article in a Blackjack Insider monthly issue. COST: $500 to $1000 per article. Sign-up for 6 months, get 20% off! Payment required in advance to receive this discount. Combine one or more of our advertising options, and receive 20% off the combined price. 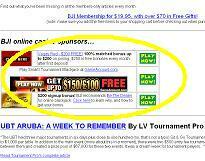 Don't want your ad displayed to US web site visitors? We'll provide this reduced exposure for 50% off the standard rates (click here for a breakdown of our visitors by region). 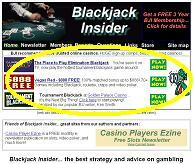 We welcome major online gaming sites to sponsor one or more issues of the Blackjack Insider newsletter. For these major campaigns, we include every advertising option available to give you total and complete coverage: run-of-site ad bar, newsletter sponsor, review articles, and promoting your casino bonuses. If you want it, we can do it... just let us know, and we'll craft the perfect campaign to fit your budget and get you the most exposure to our readers. No guaranteed visitor or sign-up delivery. No tracking of ad performance or similar statistics. All ad work (graphics/text) most be hosted locally at our BJI web site (i.e. no third-party ad display). The minimum campaign expenditure is $300. Sorry... no CPA or revenue share ads. We accept flat-rate pre-paid campaigns only. We prepare Insertion Orders for all advertisers, giving a you clear and fair accounting of your campaign. Payment by PayPal, or bank wire transfer. Cheques not accepted. All purchased campaigns must be paid in advance. Please feel free to e-mail us directly if you have any further questions: info @ bjinsider . com. 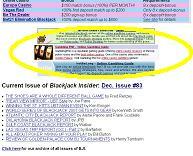 Blackjack Insider is a free monthly newsletter and web site dedicated to blackjack and gambling. Each issue includes approximately 8 or more articles by world reknown experts such as Henry Tamburin, Ken Smith, Joe Pane, Fred Renzey, Dan Pronovost, Bill Burton, Frank Scoblete, Jean Scott, and many others. As well as gaming articles, we also provide local blackjack casino playing condition reports, and the most qualified expert advise on blackjack tournaments. You can read past issues online: www.bjinsider.com. 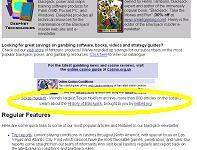 Blackjack Insider has been published every month since 2001. The e-mail newsletter has over 15,000 fully opt-in subscribers (which we send to twice a month). This is heavily 'pruned' of bounces (three-bounces and then out), so these are real subscribers ONLY from our fully opt-in online sign-up (NO external lists or 'fluff' sign-ups). We see this as our bounce rate is typically only 200 or less for each 15,000 mailing. So, 15,000 is REAL eyeballs, reading every month! And, we're not on any blacklists (our maillist company ensures this with AOL, and the other sites that monitor/filter). We have very high search engine rankings, typically PR 3 or 4 (on the first or second page of searches). We generally have about 20,000 unique web site visitors per month (by IP address), and 200,000 hits. Blackjack Insider is well known in the gambling community, and very highly cross linked with many large gambling web sites. For example, 'www.blackjackinfo.com', the top Google result on the popular search term 'blackjack', has a front page link directly to www.bjinsider.com. Many other sites, such as www.bj21.com and www.LasVegasAdvisor.com, also prominently link to BJI. About 76% of our web site visitors are from the US, 5% Canadian, 3% from the United Kingdom, 2% from Australia, 1% Germany, and the remaining countries comprise 1% or lower. Current web statistics are available on request for advertisers. 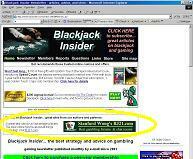 Blackjack Insider is a Canadian registered business, operated from Canada. As such, we freely accept online casino advertisers and do not require US citizen exclusions on visitors for your linked campaigns.